"Beauty and Perpetuity" by wire bender Steven Derrek, a remake of a George Bailey classic in 2010 Kiddies Carnival. The carnival of Trinidad and Tobago—one of the most renowned and celebrated carnivals worldwide—is known for its innovation, creativity, imagination and fanfare. During each carnival season, a great level of originality is generated by the mas-making [mask-making] community, which produces costumes worthy to be deemed the Couture of the Caribbean. These handmade, one of kind costumes often leave spectators and the masqueraders alike in awe. However, in recent years there has been a significant change in the quality of costumes that are being produced in Trinidad. Mass production of costumes and an increasing urge to make larger financial profits takes away from the distinctive cultural and creative aspects of mas. Wire Bending is at the heart of mas making, without which a large part of the singularity of the Trinidad carnival would be lost. These wire benders bring signature styles to the carnival and assist designers in bringing their ideas to life. Many of the wire-benders have no formal training, yet they create great engineering and mechanical feats. One of these craftsmen Mr. Albert Bailey continues to build elaborate costumes and teach the craft of bending wire. On my trip back home to Trinidad I had the pleasure of sitting with him to discuss the Trinidad carnival. NB Wire Bending is the heart and backbone of Trinidad carnival costume making. 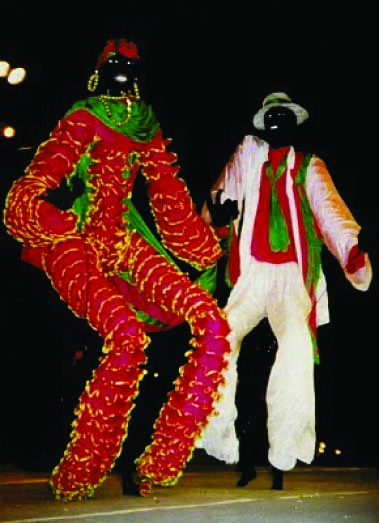 Unlike carnivals in Brazil and New Orleans that consist predominately of large floats, Trinidad’s carnival costumes are carried by the masquerader. Wire bending is not a simple procedure and the costumes are not as heavy as they may seem. It takes a great amount of ingenuity and skill to create the frames of these grand costumes that you see on the streets of Trinidad, Brooklyn, Canada, London and other Caribbean islands during carnival season. There is a lot of precision needed to create these masterpieces made of wire and tape, alongside, bamboo and fiberglass. These frames are then decorated and paraded during carnival, but beneath the feathers, fabric, glitter and beading, are these great wire structures. Natalya Mills: Tell me about yourself Mr. Bailey. Albert Bailey: My name is Albert Windsor Bailey, brother of the great George Bailey. I was born on December 4th 1936. I was born on 12 Buller Street, Woodbrook, Trinidad and Tobago. I am 73 years old and I have been working with wire since 1946. I am the oldest wire bender in Trinidad and my skills are based on form. Since the time I started, carnival has changed: we have become more commercialized and we have faster operations. We make forms from plastic now, but thank goodness we still have some forms made in wire. There are a few of us that work exclusively in wire, people like Clyde Basker, Senor Gomez, Stephen Derek and myself that do form bending. We now have the Mas Academy of Trinidad were we teach form making. If we don’t save the art [of wire bending], the Trinidad carnival would loose its singularity and become like the one in Brazil with massive floats, as opposed to wire frames carried by an individual. We are the ones that are supposed to make sure that the art [of carnival] will be on our people and Brazil will keep their art on the floats. This sort of craft [of bending wire] is dying out slowly, but we are trying to hold on to it. With people like you seeking the information, I believe the craft will be in good shape and will be preserved. But I don’t only do wire, I do copper, I do papier-mâché, I do form work, I do fiberglass work, which is now taking the place of the wire. I also do steel work. NM: So you’re a well rounded with materials. How did you get involved in this type of carnival art/ craft? AB: When George (my brother) started making mas in 1856, I was just peeping around and saw certain men doing certain works with wire and figured I can do it. I tried it and I became successful at wire. As a little child I tried it with traditional costumes: the wild Indians, the fancy Indians, as well as bringing improvement to the fireman costume. My first fireman had a big collar. Then I started to make sailor mas, and eventually I began making massive costumes. TanTan and Saga Boy from the band Tantana 1990-Peter Minshall. NM: And what was that experience like? AB: That was is what I would call a classic experience. It was a continuation from George to Peter, which I enjoyed very much. I was part of the creation of TanTan for Peter Minshall’s band Tanana in 1990. I was involved in the creation of Lord of Flies (Santimanitay). I was responsible for scorpion. If a smaller band requested me to make something I would. The craft must go on, right now I am training my granddaughter to bend wire. She designs for a children’s band in Trinidad. NM: So let’s say for example, when you did Santimanitay, what was the process? How did it start? AB: Well it started with the idea of the designer Peter Minshall. When he showed me Santimanitay on paper, I studied it and gave him a prototype. If it was satisfactory he will give you the ok to proceed and start to construct the piece with wire. NM: It is amazing to see TanTan in motion. The fact that she is so large and is carried by an individual is an engineering feat. Turning to the making of it: so you do the prototype, Minshall agrees to it and you go ahead and start. Looking at something like TanTan how do you know how much wire you need. AB: You don’t know, you just keep going. You look at the footage, if it 30 feet then you start scaling. If the legs are 50 inches then the arms will be this much, the torso will be this much etc. And you keep putting the human body into focus until you get what you are looking for. It took about 480 wire rings to make Tan Tan mobile. NM: So when you are using the wire are you using other materials as well and does that cause a problem? AB: Well the matching of the materials will be done with paint or skin color or clothes. But that’s when the seamstress comes into play. NM: Is the seamstress working alone or does she have help? AB: If the seamstress decides to get the garments made by a factor or make them herself that’s up to her. All the wire benders do is get the measurements from the individual that will be carrying the costume and work from that. I have to build the costume off of the individual wearing it. NM: Have you worked on King and Queen costumes that were being judged during the carnival? AB: I worked on all kinds of mas, individuals, Kings, Queens, and kiddies. Children’s mas are my pride now. NM: Do you use different wire gauges? AB: I do, it depends. The kid’s costume I work with fiberglass and 12-gauge wire. With adults I use 8-9 gauge wire because it’s thicker and I use fiberglass jackets or aluminum jackets on the individual that is wearing the costume. NM: When you say jacket you mean the piece that is worn under the costume that holds it up on the individual? AB: Yes the brace is what they wear to hold the weight of the costume. It’s worn like a sort of backpack. NM: So when you start with the brace, you already have someone to fit it? So before TanTan you already knew who was going to carry/perform her? AB: Allyson Brown performed TanTan and Peter Samuel performed Saga Boy. The individual must come and be measured and fitted. Everything works from the base and then you build up as high as you want. Sometimes it gets heavy. But most of the time you working with the scale and the most you want the costume to weigh is 45 or 50 pounds, reasonable enough to wear for 7 minutes on the stage to be judged. If you are wearing the costume in the streets for carnival I will try to make it lighter or to get someone to help you carry it. NM: Didn’t someone fall in there costume this year while on the stage being judged? AB: Yes, there were two separate incidents. I believe it was caused by not properly constructed costumes. When you are bending wire you bend with strength and balance, if you don’t have balance, the costume would be beautiful but the wind will take it down and the wearer will not be able to control it. NM: Some costumes have wheels to help support the person wearing it? AB: Yes three wheels, sometimes more are attached to help make the costume move along easier on the stage or the street. NM: TanTan was made without wheels, she was carried. Why is that? AB: I don’t like wheels, but I have to use wheels now because of the competition. NM: Is it mandatory to have wheels in the competition? AB: If I don’t use wheels the designer that does use wheels can make a bigger costume. Without wheels you are restricted with size because the person has to carry all the weight. With wheels you can get a larger costume. But I believe in making a costume without wheels. The masquerader enjoys themselves more without the wheels. NM: I would think it’s easier to carry a costume with wheels. AB: It’s only easier to pull the costume. If you are in a costume with wheels and there is a very strong winds blowing, you will have a hard time pulling it against the wind and you will not be able to get out of the costume without help. A costume without wheels on the other hand is easier to maneuver and you can get out of it without help. If you have wheels and you try to move against the wind you will lose your balance. NM: Looking at carnival currently, how do you feel about the emergence of the bikini, feathers and beads costumes? How do you feel about the change? AB: It’s a hell of a big change. There were times, when you would go to a mas camp (where costumes are made) and you enjoyed being there along all the festivities that were taking place. There was always food, music and a feeling of community. You could actually see your costume being made in front of you. Now it has become commercialized and you have to order your costume behind a glass window with a representative. NM: Do you feel like it has just become a job and has lost a lot of its passion? AB: Yeah, it’s a job and that job is killing my spectacle of carnival, it’s killing it. NM: Do you think the art of bending wire is dying? AB: Well not to me because I am still here and there are still a few real wire benders in Trinidad. There are still about six or eight of us left. When I say real wire benders I am not talking about the guys that put a piece of plastic and a feather and call it a head piece. I’m talking about people that can look at the Statue of Liberty and bend it out of wire free hand. NM: Do you feel people like yourself are the last of a dying breed? Who is going to take over when you guys are no longer here? Will Trinidad loose this major part of their carnival culture? AB: No, no, no! Don’t put it that way. There are some young children that are interested in wire bending. NM: So there is hope for the wire bending craft? AB: Yes there is hope for wire. Once there are children that are interested in learning to bend wire, to create great costumes carnival will be fine. The Mas Academy in Woodbrook will help with this endeavor. Also there are people like you that are involved in preserving the culture and teaching about Trinidad carnival. I am hopeful, I think we are in we are in good shape. About the author Growing up in Trinidad and Tobago, West Indies, Natalya Mills watched her grandmother create men suits for politicians; she played around in a Steel Pan-Yard while her uncle practiced his music. Her grandfather, a talented artist and musician, made her life-long love for art inevitable. After leaving Trinidad in her teen years to move to New York, she took her early influences with her. Natalya attended the Fashion Institute of Technology, where she studied Fashion Design, as well as Display and and Visual Arts Management. At present, she is completing her masters in Visual Culture: Costumes Studies at New York University. Natalya is also currently researching and working on a book about wire benders from Trinidad. Brief History of Trinidad Carnival Trinidad’s Carnival is one of the worlds most renowned carnivals and is deeply intertwined with the country’s history. In 1797, Trinidad was captured by the British and was made a crown colony. Prior to the British, the French began to settle in 1785, bringing their slaves, culture and customs to the island. In this era, the period between Christmas and Lent was marked as a time of merriment and feasting by both the French and the British. The French continued with their fancy balls, fetes champetres and making visits from house to house. Thecarnival celebration between 1783 and 1838 was dominated by the white elite. Africans and coloreds (persons of mixed race) were not allowed to partake in the festivities by law. Even though they were not permitted to publicly participate they continued to do so on their own compounds. This gave the Africans some measure of freedom to enjoy themselves and engage in the merriment. With the emancipation of the slaves in 1838 the door opened for the full participation of Africans in carnival. With this new freedom they were able to express themselves and make mockery of their former oppressors. Characters such as the Dame Lorriane, Pierrot Grenade began to emerge. Africans were involved in making masks, dancing, stick fighting, and re-enacting scenes of past enslavements. After slavery Trinidad received an influx of different cultures, ranging from East Indian, Asian, Spanish, Lebanese, Syrians and Europeans, who came as indentured servants. They came on contracts to work on the suguar plantations and were able to stay for a few years. They were then free to return to their countries of origin. Many of these people decided to stay and build a life in Trinidad. Many were allotted land and they established small businesses. These other cultures have all played a major role in the structure of modern day Trinidad Carnival. Carnival has evolved greatly throughout the years and is continuing to do so. There are many different types of carnival costumes. There are Traditional Mas costumes, where you would see Fancy Indians, Dame Lorraine’s and Moko Jumbies. There are Sailor Mas costumes, which were developed as a consequence of the arrival of American, French and British ships in Trinidad in the 1880’s. In most recent years we also have what has been called “Pretty Mas” which consist of beads, bikinis and feathers.